Home portraits are a very personal reflection of your home -and your life in the home. The choices you've made -colors, furnishing, even the art on the walls- makes your home a unique expression of your personal taste. A custom home portrait involves personal choices as well, from what is included in the portrait, to the colors we choose to highlight your homes architecture, and its placement in your home. Creating your artwork is a fun, collaborative process. Many of the home portraits I create are as a personal momento of the owners home. Quite often I'm asked to create portraits that are given as gifts; the anniversary of the purchase of the home, birthdays, a moving-away remembrance, or a Christmas gift. Thank-you gifts from real estate agents and property owners adds to the mix of how It's great to be part of the surprise! I currently work from my home studio in Denver, Colorado, where I gain inspiration from the blue skies, abundant and varied architecture, and the amazing history of this unique city. I bring more than 30 years of experience to my craft and take pride in bringing that history to my work -technically, professionally and creatively. I'm honored to be asked to work with you to create the artwork of your home. I enjoy being part of your enthusiasm, your appreciation of what makes your home unique, and the pride you have in your home. I've attached a few links that give a good sense of the process and how it unfolds. Price includes the creation of the artwork, professional art printing (up to 30"x40"), and shipping. A digital image can be provided if you'd like. ​- A custom portrait is often based on the complexity and size of the home. Please email me a photo of your home and we can discuss pricing. - Corporate, publishing, and not-for-profit projects can be discussed on an individual basis. - Multiple home projects and repeat clients (real estate agencies, property owners, etc) receive a discount after the second portrait. Please call to discuss. - The inclusion of a family pet (more than one), cars and other personal elements are welcome additions. I'm happy to discuss pricing for those additions. 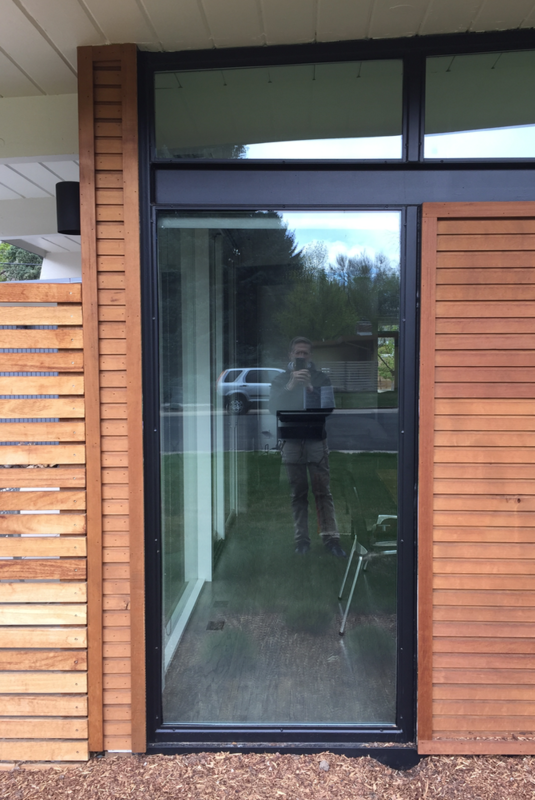 Most photos of myself these days, tend to be reflections in homeowners windows.